This is a wonderfully written, thought provoking and insightful historical text. I was taken by the conclusions that Mr. Isaacson draws from the events he recounts. When we think of inventors, we think of longhaired hermits that experience lightbulb moments. However, this is generally not the case. Invention and innovation usually result from some form of collaboration. To start with, nothing can be invented that is not already possible. That may sound obvious, but it is an important fact. Cave dwellers did not harness fire and then invent the lightbulb. Uncountable little innovations, built upon the previous thing, had to be uncovered first. As such, invention and innovation rests on the shoulders of those that came before. 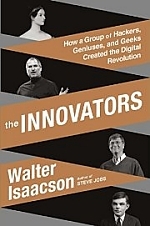 Beyond that, Mr. Isaacson suggests that most invention and innovation grows out of collaboration – out of team efforts. Edison did not invent the lightbulb. He had a factory of scientists working on the task. He had an idea and motivated a group of people to develop an answer. Part of his answer was a way to deliver the electricity that would power the bulbs, and ways to meter that electricity so that it could be marketed. Meanwhile, Nicholas Tesla, on his own, developed an energy delivery system that would have provided free energy to the world. Whom do we remember? We remember the leader of the team and the marketable approach, which in itself is a collaboration. I might argue that the marketable approach is not always the morally or globally best answer, but they are the innovations that persist. Often the more moral freebies fade away, I’m sad to say. This work focuses on, as its subtitle explains, the digital revolution. To do that, Mr. Isaacson reaches into the past, looking at Babbage and Ada Lovelace, Alan Turing, and many others. He examines not only computers but also the small innovations that made computers possible and, more importantly, networks – another form of collaboration. Mr. Isaacson’s writing style is clean, straightforward, and entertaining. Personally, I found a lot of the work rejuvenating. I was there and was tangentially involved with the early formation of the Internet and World Wide Web. I remember a lot of the moments and innovations that he brings up in this book. Many of you reading this would not know these important facts, the small steps that shaped this social-networked web of computers, much less actually remember them. There are flaws in the Internet and Web, not necessarily by design. As vital and powerful as the Internet and World Wide Web are, we must remember that it was developed in a rather ad-hoc manner. This is an excellent book for those interested in computers, networks, technology, and social networking. Though I believe, it is also an excellent book for those who want to understand the more human conditions of insight and collaboration. It is a thick book, 561 pages, though many of those are reference material. It took me some time to get through it, not due to lack of interest or difficulty in reading. It is a very easy and enjoyable read. I just had other things on my stack that kept interrupting me. Have you read Where Wizards Stay Up Late, by Hafner & Lyon? Published in 1996, it also relates the origins of the internet, focusing on the personalities involved as well as the technology. No I haven’t, but I will put it on my list. It should prove interesting, as the “Internet” was fairly new in 1996, and just becoming the World Wide Web. Isaacson’s book was published in late 2014, and contains information right up to that year. He also looks at the personalities; how they gel, or don’t, and how that creates innovation. The good thing about Wizards is that the authors talked to the people involved while memories were still relatively fresh.